KIEV, Ukraine -- Between avoiding a Russian invasion, dealing with Western creditors and appeasing an electorate still high on revolution, the new President of Ukraine will have a lot to manage after the elections set for this Sunday. 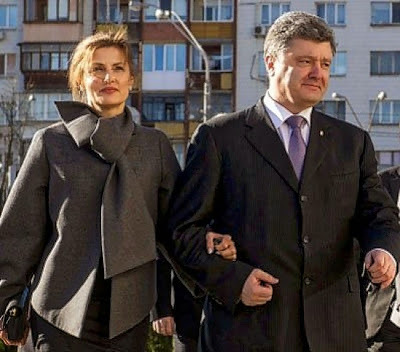 Projected winner Petro Poroshenko with wife Marina. Here's what you need to know about the latest milestone in Ukraine's political saga. Their role was to stitch up a state that had been torn apart by the winter’s revolution, holding it together until a new president could be elected and the healing process could begin. That election will be held on Sunday, and the winner will take over a nation crippled by Russian aggression, internal strife and economic maladies which have left Ukraine close to ruin. Though not exactly a political suicide mission, it will be one of the most overwhelming burdens a leader could take on his shoulders. Ukraine’s electoral authorities whittled down the list of candidates to 21, removing oddballs and malcontents, including one Darth Vader impersonator who tried to get on the ballot. That left the field stacked heavily with political veterans and insiders, many of them tainted in the eyes of voters by the corruption of Ukraine’s familiar elites. Only a few of the candidates are newcomers who were thrown into the ring by this winter’s revolution. On the far right, there is Dmitro Yarosh, the leader of a militant party of ultranationalists called Right Sector. On the opposite side of the spectrum is the socialist Olha Bohomolets, who heads a dermatology institute while moonlighting as a singer-songwriter. Neither of them stands much of a chance. The dominant issue of the elections – how to stop Russia from further dismembering Ukraine – has made military toughness a prized electoral attribute, at times overshadowing the other pressing question of the vote: how to get Ukraine’s economy off of Western life support. One of the most visible candidates, Oleh Lyashko of the Radical Party, even went so far as to issue a video of himself interrogating a captured pro-Russian separatist, who is shown in the clip handcuffed and bloodied, wearing only his underwear as Lyashko grills him on his ties to the Russian security forces. In today’s Ukraine, this is what passes for a campaign ad. In all the major polls, the projected winner by a landslide is Petro Poroshenko, an industrialist known as the “Chocolate King” because he owns a confectionery company. He was the only billionaire to take a leading role in this winter’s revolution, once even climbing onto a bulldozer and trying in vain to calm a mob of protesters. His political career, which included stints as foreign minister and chairman of the central bank, has both hurt and helped him. Level-headed voters see his political past as a sign of his ability to lead the country out of its economic malaise and to negotiate with Russia as well as the West. But those who demand a radical renewal of the political class are put off by his links to the oligarchy. It hasn’t helped that Poroshenko owes much of his popularity to a backroom deal. In March, another leader of the revolution, the heavyweight-boxing champion Vitali Klitschko, agreed to bow out of the race and throw his support behind Poroshenko. Before announcing that agreement, the two of them met in Austria with one of Ukraine’s most prominent power brokers, the oligarch Dmitro Firtash, who is fighting extradition to the U.S. on charges of corruption. The endorsement from Firtash, who has longstanding ties with the Kremlin, has allowed Poroshenko’s rivals to denounce him as a Russian stooge. But that does not seem to have hurt his standing in the polls. Of all the candidates, he still seems to be the only one with both the political experience and the revolutionary street cred to pull Ukraine out of this winter’s revolt. Will the winner be legitimate? Pro-Russian militants in eastern Ukraine have been fighting for weeks to derail these elections, or at least to erode their legitimacy. Senior officials in Kiev admit that it will be impossible to hold elections in large parts of two eastern regions, Donetsk and Luhansk, where many polling stations have been attacked or taken over by separatist fighters. That means hundreds of thousands — if not millions — of people in the country’s east will not have a chance to vote Sunday. Those who do cast a ballot will not have much of a pro-Russian candidate to choose from anyway. The two most vocal Kremlin allies in the race have been repeatedly attacked while on the campaign trail. One of them, Oleg Tsarov, withdrew his candidacy in late April, citing concerns for his safety. Those attacks are indicative of the anti-Russian mood in much of the country, but in the long run, they will also make it harder for the winner of the race to claim a mandate to rule the entire nation. Many voters in the Russian-speaking east of Ukraine will claim that their voices have not been heard. Still, the elections are a crucial step toward normality after this winter’s rebellion. Oleksandr Turchynov, whom Moscow has dismissed as the leader of a coup with no legitimate right to hold power, has been Ukraine’s interim President since February. On May 23, however, Russian President Vladimir Putin said that he would “respect the choice of the Ukrainian people,” signaling more clearly than ever that he does plan to start a dialogue with Ukraine’s new leader. What does Russia want from these elections? Russia has already achieved many of its core objectives in Ukraine. Annexing the eastern regions, as Putin did with the Crimean peninsula in March, would be costly for Russia – financially, politically and militarily – so Putin seems to have taken that scenario off the table for now. At the very least, he has stopped threatening to invade Ukraine and has pledged to pull his troops back away from the border. But whoever wins the presidential vote this weekend will not be able to ignore the Kremlin’s demands going forward. In the course of this conflict, Russia has forced its way back into the center of Ukrainian politics. The separatist rebels in the eastern regions have dug in for a drawn-out insurgency against Kiev, and by funneling support to those rebels, Moscow will be able to destabilize Ukraine from across the border as easily as turning on (or off) a tap. That will make it far more difficult, if not impossible, for Ukraine to move ahead with its integration into the European Union or the NATO alliance – the outcomes that Moscow has most wanted to prevent. In that respect, Ukraine’s new President, regardless of his or her politics, will likely be a hostage to Russian influence for years to come. What does the West have at stake? The West has pledged tens of billions of dollars in aide to Ukraine over the next few years, and to prevent that money from getting pilfered, it needs a leader who will carefully manage Ukraine’s economic affairs. Though they may not always admit it, the U.S. and Europe also want a President in Kiev who can negotiate with Russia, as all sides would prefer to see the conflict resolved without having to hit Moscow with further economic sanctions. Those sanctions could put serious strain on many European economies, particularly Germany, that need Russia not only as a trading partner but a source of oil and gas. So they will likely encourage Ukraine’s new president to negotiate with Moscow, even at the risk of alienating an electorate that has grown deeply hostile to Russia in the past few months. What are the chances of another revolution? There could always be a third. Street protests in Ukraine have become something of a national pastime, and the public demand for radical reforms has been amplified by the dozens of protesters who died defending the Maidan and its ideals. That sacrifice will be thrown in the face of any president who fails to live up to the revolution’s demands. So far, the Russian aggression has kept the warring factions in Ukraine more or less united against a common enemy, but these alliances have frayed amid the presidential campaign. In the coming months, as power and influence is divvied up, the losers are likely to accuse the winners of selling out the Maidan. That could make the new president the target of a fresh rebellion in the capital.